CrazyLake’s new show, “Legally Blonde: The Musical,” does a fantastic job of showcasing many of the talented young adults in the Hancock County area. With a mere 15 percent of the enormous cast consisting of adults, it’s really impressive to see these kids ruling the stage. I’m sure most of them will be off to college and out of the area very soon, but those that do stick around should be regulars on the area stages very soon. Besides the overall level of acting and singing, the true stand-out here is the choreography by Amy Studabaker. The various dances are not only artfully crafted but perfectly executed. This is especially amazing in the numbers with seven or more dancers performing in unison. The finale with the entire cast is particularly breathtaking. The show’s story is very faithful to the original movie’s script and the elaborate musical numbers do not detract from the story. However, like the film it was based on, it never takes itself too seriously. Hence, the running gag of Elle’s “Greek Chorus” appearing periodically thoughout. Payton Cole is sheer perfection in her turn as Elle, a ditzy sorority girl who will do anything (including getting in to Harvard Law School) to snag the man she feels she is destined to be with. Harrison Kenn is appropriately pompous and self-involved as the object of Elle’s affections. Patrick Gawrys-Strand’s does a beautifully nuanced job in his role as Emmitt, the financially disadvantaged kid who is Elle’s most faithful supporter. Studebaker is delightful as Paulette, the salon owner with her dreams of Ireland and a better life with a good man who truly supports her. Still, many of the true stand-outs are in some of the “lesser role,” such as the divine band of ladies playing Elle’s sorority sisters and the Greek Chorus. Trevor Brown’s take on Kyle, the UPS guy, was hilarious and fun to behold. Of course, I cannot leave out the amazing talents of the two most adorable cast members, Banner McDowell-Fisher and Buddy Brown as Bruiser Woods and Rufus — they were consummate professionals through and through.Honestly, I could easily write at least a dozen or so more paragraphs highlighting every single performer and role but I already feel like I’m exhausting my audience’s patience as well as running out of adjectives. So just let me say that every single cast member was sheer perfection, and if anyone out there misses this production, they will truly regret it. Performances are today through Sunday and July 17-19 at the H.J. Ricks Centre for the Arts, 122 W. Main St. in downtown Greenfield (on U.S. 40, just west of the county courthouse). Info and tickets at the CrazyLake Facebook page and CrazyLake.com. Theater on the Square is currently presenting the world premiere of a new play, “The Perfect ’10’,” by local musical talent, Sean Baker. Baker has a long musical history in the Circle City, comprising of being part of several bands, The Leisure Kings being the most well known. He is also the house pianist for Chef Joseph’s at the Connoisseur room, the current and more upscale incarnation of Agio. Being an autobiographical piece, the story is a new artistic offering for Baker. However, it does fall short of its goal. It plays more as a play being workshopped than a finished product. This is not to say that it is entirely unwatchable and does not show some promise. The story development in the second act is quite compelling and does prove that, with some polish and rewrites, that this play will work. There are quite a few good laughs to be had, especially Sean’s encounter with “Beaux Derek.” Maybe with the trimming of unneeded characters, Justine and Allyson in particular, it would flow better. The interactions with Sean’s therapist might be better reflected with her in voice-over, save for a late-night phone call which plays perfectly. Also, while the bartender’s actions are quite funny, he does tend to upstage and draw attention from some of the more vital dialogue. A reining in of his antics is needed. Plus, it wouldn’t hurt to add a few more songs and eventually turn the show into a full-fledged musical. I would advise you to either watch or re-watch the movie, “10” (1979, directed by Blake Edwards, starring Dudley Moore and Bo Derek) prior to the show as there are quite a few inside jokes and nods to it in the play. Still, if you’d like to catch a rising talent at beginning of his writing career, go and check out “The Perfect ’10’” at TOTS, 627 Massachusetts Ave., Indianapolis. Call 317-685-8687. Producer and director Bob Harbin, a/k/a Bobdirex, is notable for bringing shows that are new and/or rarely-seen in Indy, and always thought-provoking. So, as he now presents the Andrew Lloyd Webber and Tim Rice standard “Jesus Christ Superstar” – which has featured rocker Sebastian Bach, cinema-version star Ted Neeley and others over the last decade or two – I had to ask, as I prepared what I would write here: What new thing(s) does Bob feel he is showing us with his “Superstar”? “I’ve seen a couple of those local productions, and always felt like little attention had been paid to casting people who could really sing the leads – I felt like I was being yelled at when I think the folks were simply trying to hit the notes. I’ve wanted to investigate this show, but promised myself I’d never do it without the voices. “I also wanted to do something that didn’t feel like it had to move to another time zone to make it relevant, and cast it with the best folk with a blind eye to gender, color, size, etc., which is something that’s important to me every time. Well, he nailed it on the voices. 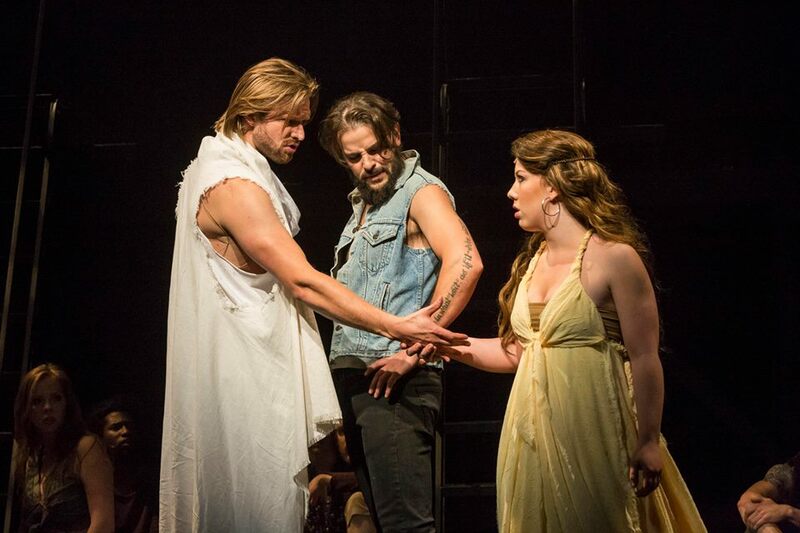 In “Superstar,” playing Thursday through Sunday and June 19-21 at the former Civic Theatre stage at Marian University, Joe Doyel sings with all the necessary power needed for the lead role, Judas Iscariot. For the other male lead, Patrick Clements embodies the full range of feelings – gentle, irritated, consoling, angry, despairing and humbled – necessary to portray Jesus. He never overdoes it, which would bring too much attention to the actor rather than the Christ he represents, but you still sense the authority he brought to his red-letter biblical utterances. But this play’s biggest revelation is 17-year-old Julia Perillo as Mary. Her sweet, strong voice is tested but doesn’t break, providing the necessary feminine counterpoint to Judas’ proud bluster. When she sings of her beloved Christ, “he scares me so,” we shudder with her. In another vocal coup, Harbin has brought Michael Lasley – usually encountered as the “voice of God” who tells us to silence our cell phones at the Booth Tarkington Civic Theatre – onto the stage as Caiaphas to rumble with astounding clarity all of those low notes. Ty Stover is excellently cast as Pontius Pilate. We’re used to seeing him in lighter roles, but it’s easy to see how he can still do such an iconic dramatic role in his sleep (which he doesn’t – he was totally awake, I’m sure). The role of King Herod, the closest Webber and Rice come to comedy relief, is played flamboyantly by Danny Kingston. Though the performance verges on “Queen Herod,” he still makes it work. Overall, Harbin’s direction brings us the familiar story and songs in a highly competent manner that holds our attention, aided by Kenny Shepard’s choreography and a simple set with laddered structures that take advantage of the roomy stage. He also makes the decision to not soften the ending: What happens beyond the cross is left to the viewers and their faith. Whether you’ve never seen this classic musical or sat through it a hundred times, this production is worth attending. Find the stage at 3200 Cold Spring Road, Indianapolis. Get tickets at 317-280-025 or bobdirex.com. Among the many stage shows opening this weekend, “American Idiot,” the rock opera by punk-pop band Green Day, opens Thursday at the Phoenix Theatre. We saw the band on the “Idiot” tour a few years ago, and have the hit album as well as its similarly-themed follow-up, so are very interested in seeing this. The Broadway and touring productions had mixed reviews, but punk has always been a not-for-everyone genre. Wisdom Tooth, a thought-provoking new company in residence at IndyFringe, opens “Jason and (Medea).” Note this is not “Madea” and has no relation to Tyler Perry. So, it should be very good. 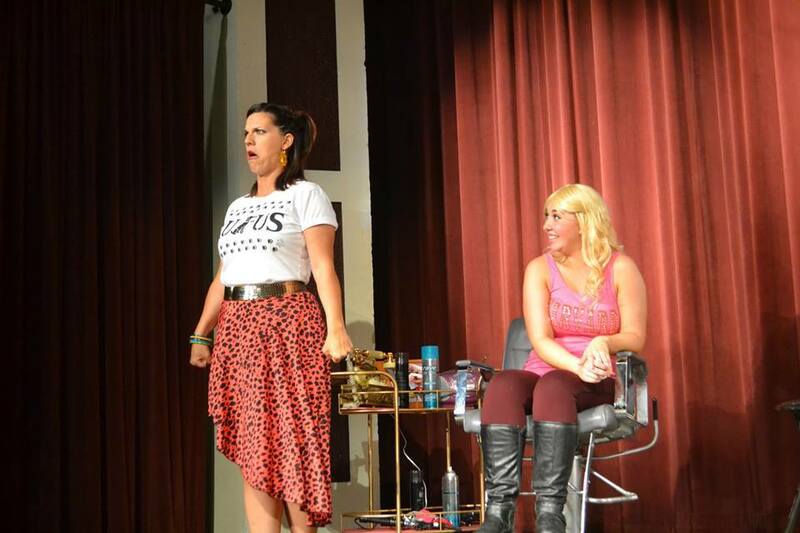 “The 25th Annual Putnam County Spelling Bee” opens at Buck Creek Players. I won’t be able to make it, but I do encourage everyone to go see this. (And not just because I like the folks at BCP.) This show is a LOT of fun, and a couple of brave souls from the audience get to take part as spellers (but not against your will, relax!). “The Cherry Orchard” by Eclectic Pond opens at the Opera Center. One of the great Chekhov plays presented by an excellent Shakespeare company, here’s another one I can recommend without seeing. 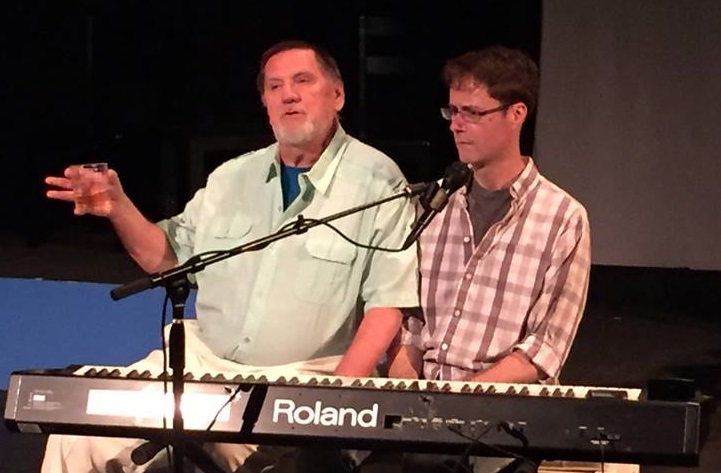 Director Bob Harbin, a/k/a Bobdirex, has his big summer production, “Jesus Christ Superstar,” opening this weekend on the former Civic Theatre stage at Marian University. The world premiere of “The Perfect 10” opens at Theatre on the Square. Hopefully we’ll be there Sunday. And we’ll be staying for “Going Going Gone” (the auction-based improv show in which audience members bid on and get to keep the props) and the free Tony Award watch party. There is also a cabaret of the hits of the 70s and 80s this weekend only at Carmel Community Players. Meanwhile, “Peter Pan” continues at Beef & Boards Dinner Theatre. While this is not a new show for B&B, it does feature the wonderful antics of Jeff Stockberger as Cpt. Hook, and, making her B&B debut, the incredibly talented Phebe Taylor (a frequent flier at the Phoenix) as Pan. And the food there is good, so it’s a good deal. So, here we are, starting out the bloggy part of this site. This time it’s a list (maybe I should have titled this “Nine shows you should see this weekend even though seeing them all in the next few days would be physically impossible” or “Start a theatre blog with this one weird trick” to be more Internetty) but we reserve the right to make future posts even more interesting. – See you in the audience!